Climate change describes the changes that happen to the earth’s overall temperature. Over millions of years the temperature has varied a lot – the Brisith Isles have sometimes been tropical, sometimes under water, sometimes frozen. Sometimes the variations happen very slowly, allowing plants and animals to migrate and adapt to the changes. Sometimes they happen faster, leading to widespread extinctions. Is the climate changing now? Expert scientists from all over the world agree that the average global temperature is increasing rapidly. This is due to the huge amount of gases that have been released into the atmosphere by modern ways of life. Burning fossil fuels creates carbon dioxide, an invisible gas which increases the greenhouse effect – the blanket of gases around the earth that keep the heat in. As we have burnt coal, oil and natural gas at increasing rates, our carbon dioxide emissions have risen, causing increasing rises in temperature. 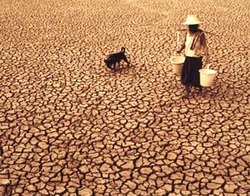 What are the effects of Climate Change? We are already seeing the effects of climate change. In some places there have been extreme droughts, some places have serious flooding, many places have had record temperatures. People living on land close to sea level are feeling the effects of what seem like small increases in sea level as ice melts. But there may be more serious effects to come – as artic ice melts the white surface that reflects heat well is replaced by dark sea which absorbs heat, which in turn speeds up the warming and melts more ice. Close to the artic circle are thousands of miles of tundra – frozen ground that holds enormous quantities of methane, another much more powerful greenhouse gas. If this melts all the methane will be released, leading to more extreme warming. There are many of these “positive feedback loops” – where warming causes something that leads to more warming, creating a danger of runaway climate change. These changes are happening much more rapidly than anything caused by natural cycles, giving plants and animals little chance to adapt or migrate. This could be really critical if we think about key species such as insects that pollinate our crops, or our fish. What can we do? One of the key recognitions of Transition is that we need to find ways of living that respect the biological limits of the planet. Many of the projects and proposals that have come from TTT are exploring ways we might do that. Imagine if we can design all our everyday activities so that they work more like plants or, even better, a woodland ecosystem. There are no waste bins in a natural woodland - anything that is produced by one plant or creature is used by another, especially CO2! Many us involved in Transition think of what we are doing as a way of 'closing the loops'. We are working out how we can link one activity with another so there is minimal waste and no harm to the natural world on which we depend.